Is there a simple way to change things in ones life? Can you just walk away from something you have been doing since you first were in high school. Well I have been trying, its not been easy, you see caffeine and I go way back, even before I graduated in 1985, I know I am dating myself, but that’s okay its been a great life, but now as I reach what we now consider 1/2 way or just about, I want to change the way I do things. Maybe it’s because I have my first grandchild on the way, maybe it’s been I love/hate relationship with caffeine, or maybe it’s just because I finally think I can and will succeed. 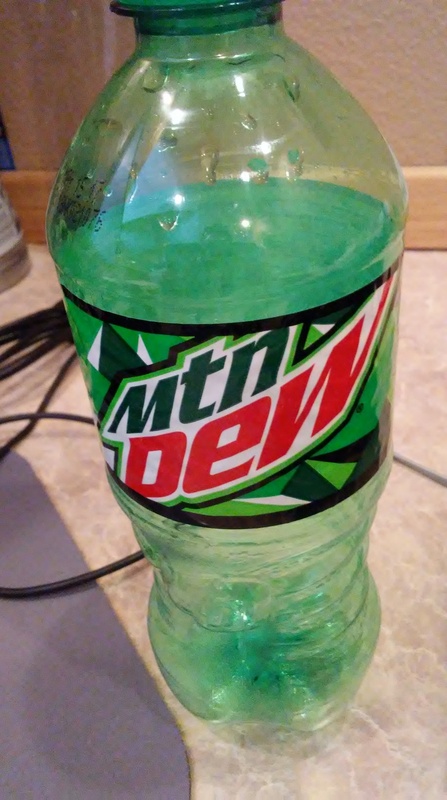 The change I am talking about is giving up Mountain Dew, I know you were thinking coffee, but I never really cared for that, but the citrus taste and effervescent bubbles of Mt. Dew now that is something I did get stuck on, there have only been a handful of days since I turned 10 that I can remember not having at least one can or more a day. But slowly I am taking back my life, my way. Monday is never a good day to start anything like giving up caffeine. So here I am on Tuesday and I just cracked the top on my last 20 oz bottle, I know what I am in for too, because my brain has had caffeine all these years the headache I get will be massive. I can tell you it is worst than a migraine, and it just doesn’t go away in a few hours no I will be with pain for a couple of days…and to try to function at work without loosing it will be difficult. But I have never wanted to succeed before like I do now, I have purpose in giving up this addiction. And yes, I feel it is an addiction. I can’t go for a day without having one. It’s something I compare with alcohol addiction. I have had it for so long that now when I try to give it up my body doesn’t know how to deal with it being gone so it tells me I have to have it…but this time I am going to be stronger, this time I am going to win. So you are sitting there right now thinking well that should be easy to give up. I could do that, no problem. Now I want you to think of something in your life that you have been with since before age 10? Are you coming up with anything? Now think that you have to see, feel or have that object everyday. No matter what you need to, if you don’t you feel disconnected from the world. Do you have something in mind? Now someone tells you – that object is no longer available, they are not going to be making it ever again. What would you do? How would you feel? Lost, afraid, scared? How would you cope? Where would you turn for support? Would your friends be with you in your choice? Would they come along side of you and cheer you onto victory? This is how many that are fighting addiction feel, trapped that they are not strong enough to give up, trapped because no one comes along side of them and says “I believe in you, you are stronger and you will make it!” That is all anyone fighting addiction wants, they want to be understood. They want support, they want to know giving this thing up you will still be their friend. So as I walk this caffeine free life, I want to share with you what its like. This will not be easy, I have tried to do this many times before only to fall and struggle. You know that I am Christian, you are probably thinking why don’t I just surrender it to God, he can take care of this for me, but as with any addiction it becomes habit, and some habits become rooted in sin. Yes, my God could take that all away the headache, the need for the caffeine, the wanting of the bubbles tickling my throat but I went back time and time again to have it. He did not force me it was my free will that choice to do so, that is what sin is, the freedom to choose. The knowing it is not right, not good for me, but doing it anyways, that is sin…and until we surrender that sin to God we can not ever be free. This may not be the way you think about the addiction but it is the way I view it. So now I am giving my sin of greed away – for it is my own greed that I have not nor would I give up Mt. Dew, it was my own greed to have it, that was my self centered thinking, I now see I don’t need it, it does not make me who I am, it has no need to be in my life other than my own greed for it. So I am giving my greed to God, he can have it I don’t want it any more. Are you facing something like this? Do you need answers to tough questions? Do you want help staying sober, or drug free, or what about shopping or anything else we could so easily slide into that ME NEED Thought pattern. My only need now is to read and understand more of the Bible, we are facing more unbelief in our world than belief, use me LORD to make a difference, use me LORD to help others see you for the first time, use me LORD to show others it can be done, use me LORD as a friend to many.